I heard about Goga Goat Yoga (https://www.facebook.com/GogaGoatYoga/) through Facebook and signed up to be notified of the next classes in Austin. I received a Facebook notification that tickets were about to go on sale and then happened to be online to buy a ticket to a Saturday class. A friend tried to buy her own ticket later that morning and all of the classes were sold out, so sign up and move quick to get in on this class. I arrived at a parking garage in downtown Austin on a clear, sunny day (thankfully, the facilitators had sunscreen and water available). The class took place in a partitioned area of the top level of the parking garage. There were about ten baby goats in a tented area near the class, and their handlers brought the goats out and helped to circulate the goats among participants. They helped some goats climb onto us we posed, especially in poses where goats could use us as mountains, such as downward facing dog, plank, or low lunge. Goats love to be up high and balance, so this was a very interactive class. I ended up holding a low lunge for about five minutes as a goat groomed my hair and then curled up on my low back to groom herself. The goats smelled good and their hooves did not hurt, probably due to their size. House Rabbit Resource Network (HRRN) is a non-profit rabbit rescue group in Pflugerville, Texas. They have offered Bunny Yoga as a fundraiser for the past few years. Participants can find out about this periodic event on the website (http://rabbitresource.org/) or Facebook (https://www.facebook.com/RabbitResource/). I was fortunate to teach the class last week, and I led a Hatha practice while bunnies hopped around the room, on and off mats and occasionally onto humans. Volunteers from HRRN kept an eye on the rabbits while I led the practice and participants enjoyed the quiet presence of their furry friends. Blue Cat Cafe of Austin, Texas is a non-profit cafe where adoptable cats roam the floors, furniture, and multi-levels of cat-friendly climbing spaces. For the past year, they have offered a weekly yoga class on Sunday mornings from 9:30-10:45 pm. The cats roam and stretch out around the participants--the cats even have some mini-yoga mats on which they can "practice" yoga. I was lucky to have a cat climb onto my stomach for savasana. You can find more information and buy tickets at bluecatcafe.com. 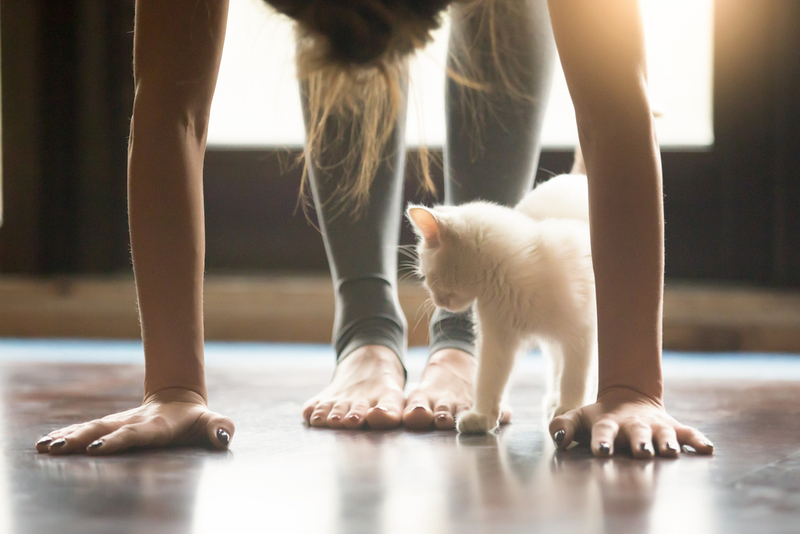 If you enjoy a yoga practice with animals, you can also enjoy a home practice and let your animals roam free and join you as you practice. I am not intending for these comments to be an endorsement, and I do not have business relationships with any of these organizations. Free Day of Yoga Austin on Monday!! !